Over the past 33 years I have competed in nearly 400 races and triathlons. Many of these have been in beautifully scenic races, big ones little ones, short ones and 100 milers as well as an Ironman. 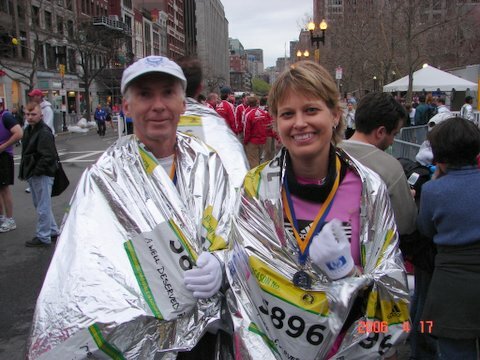 There have been too many wonderful experiences to pick a list of favorites without leaving out a lot of them but without a doubt the Boston Marathon 2006 was the greatest experience of my running life. But it wasn't the history or the tradition or the time I finished the race that made it so special. No,it was because I had the honor and privilege of running the race beside and witnessing the courageous effort of my dear friend and training partner Karla. Most of my friends know the story but for those new readers that don't know it, she had just under gone two surgeries for stage 3 breast cancer 6 weeks before the race and was about 3 weeks into chemo therapy as we lined up for the start of the race. It was actually a miracle of sorts that I had even qualified and without her I never would have been able to do it. I'll never forgot the sick feeling in my stomach when I got the call from her to report that the biopsy was positive just 9 days before I was to run my last chance for qualifying at the 2006 Myrtle Beach Marathon. My pr was 3:47 and I would have to knock 12 minutes off that time. Now we didn't even know if Karla was going to be able to run at Boston but if there was any way possible and the doctors would allow it she was planning to run. And after all the miles we had run together in every kind of heat and cold, dark and rain, I knew I had to be there for her. Of course I did pull off the miracle and just barely qualified but as I crossed the line with a huge pr and a BQ instead of smiling I burst into tears, my heart breaking for what I knew The Marathon Princess was facing a week later. In the end all turned out well. We had the wonderful experience together at Boston. If you haven't read the stories , here are the links. Part 1 tells of of the beginning of the plan and my first attempt to qualify at Richmond in Nov. 2005. Part 3 is the Boston 2006 race report. Karla and I made an agreement that when she was able to return to full strength that we would once again train to qualify and return to Boston to celebrate and race it hard. Her treatments took nearly a year and then it took another full year for her to recover back to normal after the ravages of chemo-therapy and radiation. Finally in 2009 we decided it was time to start planning to comeback as soon as I got my Ironman finished in June. By now we had a new friend and training partner, Lisa "Mountain Girl" Howell working towards the same goal and in a near storybook tale all 3 of us qualified in the same race at the 2010 Tobacco Road Marathon. Fortunately we were all three able to get into Boston this year despite the race filling it's entry limit in 8 hours ! Karla just had another checkup and after 5 years since the first diagnoses is cancer free and strong as ever. Sadly she has been struggling with foot injury issues since last Fall so she will not be in top shape but at least she is well ! And that my friends is why I'm so excited to make my return. That is a lot of history . . . of the race itself and your history with it! Hope you have a great experience! GO FOR IT,SON. YOU ARE THE GREATEST!! Karla is my marathon angel. Last summer I was struggling to finish the Grandfather Mountain Marathon, Everything hurt. Karla brushed beside me and said "Come on ,you can make it under 5 hours." Because of her encouragement, I did.